Course 4 of 4 that comprises the Architecture and Systems Engineering Professional Certificate Program. This course may be taken individually, without enrolling in the professional certificate program. Organizations around the world strive to use quantitative information methods in their systems engineering practices, but many struggle to implement them effectively. 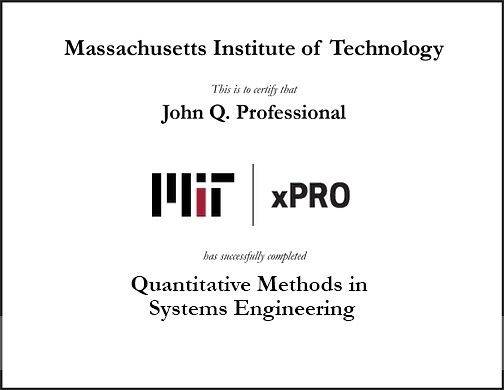 This online course covers the fundamentals of quantitative methods in systems engineering and provides basic how-to instruction for implementing these methods. The course is designed for engineering practitioners and managers looking to increase the use of quantitative information methods in existing systems engineering practices. The objective of the course is to provide learners with the basic knowledge and skills to determine when, where, and how to employ these methods and techniques. The curriculum provides learners with an overview of design space exploration using models, as well as methods for analyzing and presenting the output of a model. A number of tradespace models will be presented and exercised as case studies. Define the criteria and decisions to be answered with quantitative analysis. Evaluate concept alternatives in order to recommend a preferred alternative. Identify the multiple key cost and benefit criteria that frame a system decision opportunity. Construct a value hierarchy for a stakeholder/beneficiary/decision-maker to inform system design decisions. Articulate the core concepts of value based thinking. Choose the relevant axes and representations for a tradespace. Interpret the results of a tradespace. Identify the fuzzy Pareto front in a tradespace. Critique a decision analysis model by identifying sources of uncertainty and variation. As the director of MIT’s Systems Engineering Advancement Initiative (SEAri), Dr. Rhodes leads a team that is focused on advancing the theories, methods, and effective practice of systems engineering applied to sociotechnical systems. She conducts research on innovative approaches and methods for building and designing complex systems and enterprises, including predictive indicators of performance, empirical studies of engineering systems thinking and practice, and planning for uncertain futures. Her research is driven by the desire to design socio-technical systems that more effectively address significant societal needs in a dynamic world. She is involved in research across multiple sectors including defense, aerospace, transportation, energy, and commercial products. She also serves as a senior lecturer in the Engineering Systems Division and the principal research scientist in the Sociotechnical Systems Research Center (SSRC). Before joining MIT in 2003, Dr. Rhodes held senior management positions in systems engineering and enterprise practices at IBM Federal Systems, Lockheed Martin, and Lucent Technologies. In his dual roles as Research Scientist and co-founder of SEAri, Dr. Ross conducts extensive research while also advising graduate students. His work is focused on managing unarticulated value, designing for changeability and value robustness, dynamic tradespace exploration for complex systems, and space systems design. He has performed both science and engineering research for a range of industry partners in government, industry, and academia — among them NASA Goddard, JPL, Smithsonian Astrophysical Observatory, Boeing Satellite Systems, Harvard, and Florida State University. Prior to joining the Engineering Systems Division, Dr. Ross was a Postdoctoral Associate with the MIT Center for Technology Policy and Industrial Development (CTPID) and a research assistant with the MIT Lean Aerospace Initiative. He received his dual B.A. in Physics and Astronomy and Astrophysics from Harvard University in 2000, and he completed two M.S. degrees — Aeronautics and Astronautics, and Technology and Policy — at MIT in 2003. He completed his Ph.D. in Technology, Management, and Policy of Engineering Systems at MIT in 2006. Guest lectures from industry experts from Boeing and NASA, as well as case studies drawn from different engineering fields. Earn a Certificate of Completion and 2.0 CEUs from MIT xPRO. Participants of this course who successfully complete all course requirements in order to earn a Certificate of Completion are eligible to receive 2.0 Continuing Education Units (2.0 CEUs). Acceptance of CEUs depends on the organization to which one is submitting them. If your employer requires any additional information, MIT Professional Education can answer questions and provide information, but we cannot guarantee that any particular organization will accept our CEUs. This program is well suited for engineers, architects, directors, senior managers, and technical leads who want to optimize their operational, manufacturing, and design systems. While it is appropriate for professionals across a wide range of industries, it may be of particular interest to those in aerospace, automotive, defense, and manufacturing. Departmental teams are encouraged to apply. Unfortunately, US sanctions do not permit us to offer this course to learners in or ordinarily residing in Iran, Cuba, Sudan, and the Crimean region of Ukraine. MIT Professional Education truly regrets that US sanctions prevent us from offering all of our courses to everyone, no matter where they live. Go to mitprofessionalx.mit.edu and click on the program title. Then click “Enroll Now.” You may be prompted to first register for a mitprofessionalx account if you do not have one already. Complete this process, then continue with checkout and pay for the course. After you complete registration, you will receive a purchase receipt and confirmation/instructions via email. For a group of 10 or more individuals, you can pay via invoice. To be invoiced, please email sysengx-support@mit.edu with the number of individuals in your group you want to register. Please note that our payment terms are net zero, and all invoices must be paid prior to the course start date. Failure to remit payment before the course begins may result in removal from the program. No extensions or exceptions will be granted. Individual registrations must be completed by May 25, 2018. For group sales, purchases can take place up until May 21, 2018. Please note that once registration has closed, no late registrations or cancellations will be granted. Individual participants must complete registration and pay online with a valid credit card at the time of registration. MIT Professional Education accepts globally recognized major credit or debit cards that have a Visa, MasterCard, Discover, American Express or Diner's Club logo. Invoices will not be generated for individuals, or for groups of less than 10 people. However, all participants will receive a payment receipt. Payment must be received in full; payment plans are not available. Cancellation requests must be made two weeks prior to the course start date. Any requests received after this will not be eligible for a refund. To submit your request, please include your full name and order number in your email request. Refunds will be credited to the credit card used when you registered and may take up to two billing cycles to process. Cancellation requests must be submitted to mitxpro@mit.edu.